The data you would like is available to annual subscribers. That page you clicked on? It is just one of more than 10 million pages and page views available, all updated monthly. Anyone who can benefit from having rich and deep trade data at their fingertips. Get instant access to all of our data for one full day! No credit card required. In addition to finding the data at the page I clicked on, what are the other benefits? WorldCity offers data for more than 450 U.S. airports, seaport and border crossings. So, for any one of those “ports,” you can see a wide array of data. You can determine the leading exports and imports for up to 225-plus countries, by current month, YTD or latest annual, and by value or tonnage. You can determine how that trade occurs – by air, ocean or land, by percentage and value or whether there’s a trade deficit. WorldCity also offers data for more than 225 countries. For any of these countries, there is equally rich and deep data available. WorldCity also offers greater depth on all exports and imports. What is the source of your data? WorldCity only uses data from the U.S. Census Bureau, updating it monthly. Can I view this data on multiple platforms? Yes. Once you are a subscriber, you will have access to the data anytime, anywhere or any device. What can you tell me about WorldCity? WorldCity, founded in 1998 by President Ken Roberts, has been producing annual TradeNumbers publications for a wide variety of communities since launching Miami TradeNumbers in 2001. It has produced TradeNumbers for many of the nation’s leading Customs districts, ports, border crossings and countries, including Los Angeles, Seattle, Dallas-Fort Worth, Houston, New Orleans, New York, George, China, South Korea, Mexico, Perishables and numerous others. 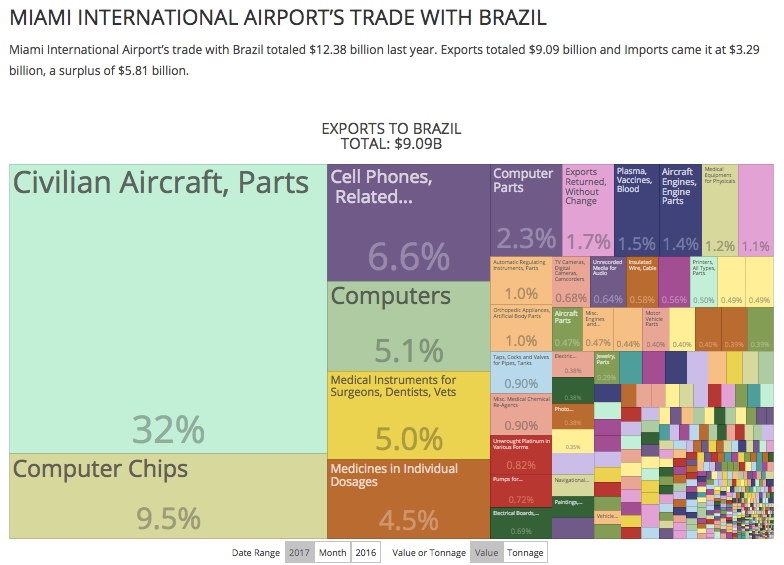 It has been publishing trade data at ustradenumbers.com for more than a decade. In addition, Mr. Roberts is a regular speaker nationally, posts a weekly Trade Matters video at worldcity.tv, is a regular contributor at Forbes.com on trade, and is one of a dozen members of the Federal Reserve’s Trade and Transportation Advisory Board. ustradenumbers.com offers a ton of free data. Please take a look around by by clicking on any of the menu items at the top of this page! Then if you need addition in-depth data analysis such as Port Miami's trade with Brazil then you need to sign up for a premium membership. Please contact us for more details. How do I find specific data? There is a search bar on the top of each data page. You can search by country, port, export, import. You can also search by country code, port code or harmonized code. How many years of data do you have? We currently have annual data going back to 2011 and monthly data from 2013 but our database is growing monthly and other datasets will be added over time. Do you have trade data with specific companies? No. Currently, our data is about specific exports/imports ( commodities ) from/to U.S. ports with foreign trade partners. For instance, if you are looking for exports of cotton from the Port of Los Angeles. We have it. You can drill down further and find which countries the Port of Los Angeles trades cotton with during a specific date range. To request pricing for annual subscriptions and gain access to millions of datasets.